Exterion Media has launched London's first fleet of digitally "wrapped" geo-targeted buses with Google onboard as the first brand to use the ad tech. Over the coming weeks, 20 London buses employing the technology will be introduced to London’s streets. Each bus will carry a digital screen on its side. The techology allows brands to run imagery and copy that is pertinent to the locations of the buses, for instance according to nearby shops or London landmarks. 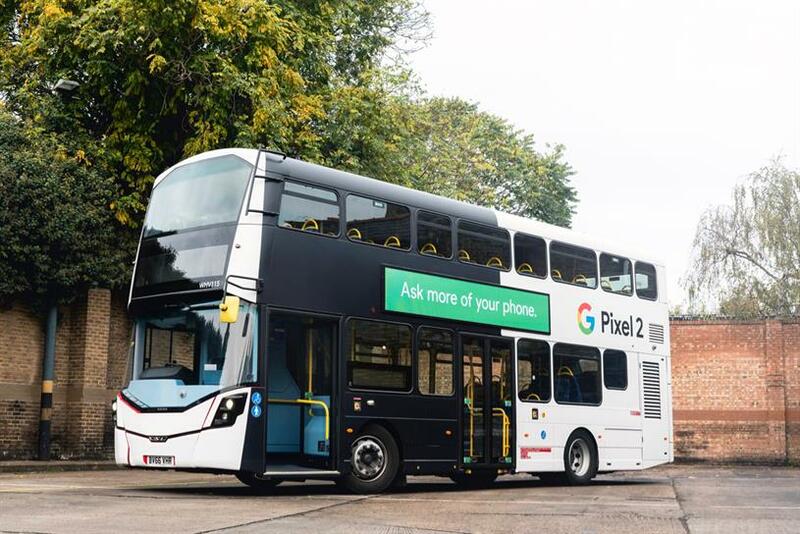 Google is using the buses to promote its newly-unveiled Pixel 2 smartphone, running a three-month campaign that displays geo-targeted messages to bus passengers across the UK capital. The campaign was conceived, planned and booked by Talon and OMD through Exterion Media, while Bartle Bogle Hegarty and Grand Visual were responsible for the creative and production respectively. The digital screen tech was developed by Hive, while Exterion and its partners worked closely with Transport for London, Go Ahead and Arriva to develop the technology. The roll-out of the bus screens is part of Exterion Media’s bid to become a digital media company focused on using data to connect with audiences. The company has developed innovations including lenticular displays and DX3, a soon-to-launch full motion digital network on London Underground. This summer, it launched an experiential arm. Dave King, Exterion Media’s managing director, said: "We were approached by Talon to develop a unique digital channel for London and launch it with a prestigious advertising partner, Google. "This is a huge moment for bus advertising; the product delivers stature, movement, scale, dynamism and geo-targeting – offering a whole new dimension to broadcast and narrowcast through this hugely attractive channel."